As counter-terrorism operations at the Pathankot air base continued for the second consecutive day, the Union government on Sunday said it was unsure if more terrorists were still holed up. The comments by Union Home Secretary Rajiv Mehrishi came a day after Home Minister Rajnath Singh tweeted saying the operation had been completed with the killing of five terrorists. Singh later deleted his tweet. "We are sure that still there are at least two more terrorists as firing have come from two different places. But we are not sure whether there are some more. We will come to know the number of terrorists only after the completion of the operation and body count," Mehrishi told a press conference. He said four terrorists were killed in the gun-fight on Saturday while firing resumed this afternoon at two places in the air base. Asked about the Home Minister's tweet, Mehrishi said he was giving authentic information and "doesn't know what others are saying". He said a Superintendent of Police of Punjab, who was kidnapped along with two others on Friday and was left off later, had said that there were only four terrorists. Asked whether there is any lapse while dealing with the terrorists as seven security personnel were killed so far despite having prior information about terrorists, Mehrishi denied there was any lapse. "There was no lapse. Some casualties are obvious when there is an operation in this scale," he said. Mehrishi said so far there were seven casualties -- six Indian Air Force personnel (including five Defence Security Corps personnel and one Garuda commando), and one NSG officer, Lt Colonel Niranjan. Eight IAF personnel and 12 NSG commandos were also injured so far. The NSG officer was killed while trying to defuse a grenade attached with the body of a terrorist. Five NSG commandos were also injured in the incident. Seven other NSG commandos were also injured in separate incidents in mopping up operation. 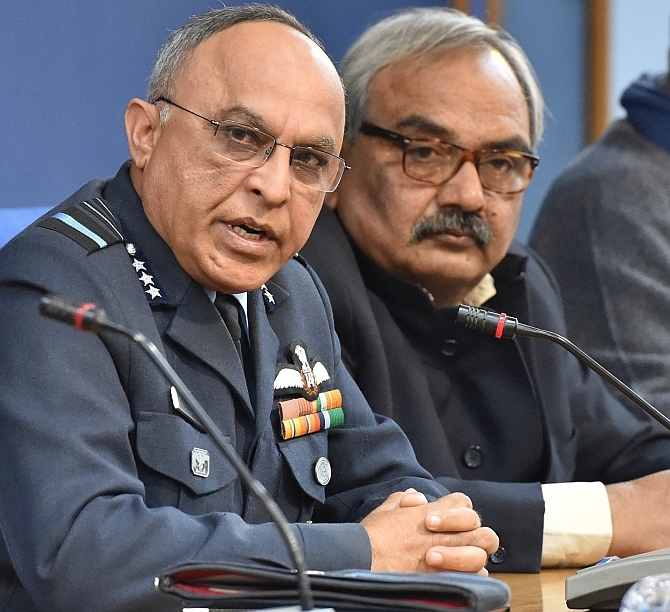 Asked when the operation against the terrorist would be over, Director General (Air Operations) of the IAF Air Marshal Anil Khosla said they were not sure about that as the action against the terrorists was still on. Asked why the terror attack could not be foiled despite deployment of a large number of NSG commandos, the Union home secretary said the team of the specialised force was waiting in Pathankot for the terrorists as the exact point of possible attack was not known. "When they (terrorists) attacked the air base, the NSG team moved immediately," he said. Air Marshal Khosla said the main aim of the terrorists was defeated as they could not reach the technical area of the Pathankot air base where high valued assets were kept. "The first contact with the terrorists was made on Saturday morning at around 3.30 am. The terrorists were contained in an area where there is heavy growth and shrubs. The operation is now at a matured stage," he said. The IAF officer said the operation was "slowed down" on Saturday after the killing of four terrorists as security forces were not sure whether there were more terrorists still at large. The gun-fight resumed this afternoon when the terrorists began firing from two places. Asked about the terror group which could be behind the attack, the home secretary said as per initial information it was Pakistan-based terror outfit Jaish-e-Mohammad but it would be confirmed only after the operation is over. Mehrishi said there were intelligence reports about infiltration attempts by JeM and Lashkar-e-Tayiba militants and based on these inputs, 40 terrorists were neutralised by security forces since August 2015. He said after getting information about the terrorists, National Security Advisor Ajit Doval called an emergency meeting on Friday, which was attended by Army Chief General Dalbir Singh Suhag besides others, to take stock of the situation and necessary instructions were given to secure government offices and vital installations along the western border. Alert was sounded in Punjab and all air stations in the area were put on high alert, he said. The home secretary said AOC-in-C Western Air Command, Air Marshal S B Deo is in Pathankot and coordinating the operation, which is jointly being carried out by IAF, Army, NSG and Punjab Police. He said the terrorists were located through aerial surveillance and then counter attack was launched. Mehrishi said one grievously injured DSC personnel was airlifted to Chandigarh for further treatment.